Growing up on a dead-end street, in the shadow of a steel mill, in a sad, sooty section of Pittsburgh, Chuck Obremski awakened daily to the sound of prizefighters punching a heavy bag in the basement, where his stepfather ran a boxing club. It was a tough town, in even tougher times. "People in Pittsburgh mask their memories with shots and beers," Obremski said. It wasn't the best foundation for family life, but sports provided a positive force in his hardscrabble youth. Still, he didn't dare dream that one day he'd have Angels in his corner and a World Series ring on his finger. The kid who went to Forbes Field to watch Roberto Clemente play would go home later and fire rocks at phone poles, pretending to be the Pirates legend. Now 48, Obremski - the chaplain of both the Los Angeles Angels of Anaheim and the Mighty Ducks - is battling pleomorphic soft-tissue sarcoma, a rare and deadly cancer. He's firing everything available at it, but doctors say this may be his final inning. Reeling from chemo cocktails and transfusions, and coughing up blood, Obremski still ministers to his athletes, missing just one service at the ballpark since his diagnosis two years ago. Before each Sunday home game, he prays with the Angels and their opponents for 20 minutes. "I can't tell you how many times, out on the field, guys I'm playing against tell me, 'Oh my gosh, chapel was awesome today. You are so lucky to have Chuck,'" Angels right fielder Tim Salmon said. 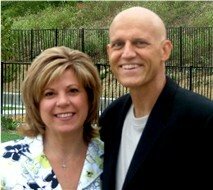 Obremski continues to serve as senior pastor of Kindred Community Church in Anaheim Hills, too. He hasn't missed a Sunday there, despite five surgeries and a litany of treatments. Doug MacGinnis, a church elder, marvels at the courage: "On a Monday they had to cut through his ribs and remove the lower lobe of one of his lungs ... the next Sunday he was back in the pulpit." Obremski is upbeat. "A year ago, I wasn't sure I would be here now, but I got up today, and everything after that is a bonus." That positive attitude wasn't inherent in the kid from Pittsburgh who pretended to be Clemente. Obremski was a pretender in other ways, too. At 18, he married Linda, pretending to be a man - though still a boy. Because he was baptized and married in a church, he pretended to be a Christian, too. When his first baby came along, Obremski pretended to be a father, but was unprepared. Problems plagued his marriage. Seeking a fresh start, the Obremskis moved to Southern California. Looking back, Obremski recalls that somehow his problems got packed inside the U-Haul that he pulled West. When Linda found work in a Christian company, they began to see those problems in a new light. Chuck took a job with the same firm. There, he saw people operating in a highly ethical, Christian environment. He found it weird. Then, at a Valentine's Day dinner in 1978, he found Jesus on the menu, and ordered up a new life. Soon he was teaching Sunday school and serving as chaplain for the Los Angeles Rams. Eight years ago he became the Angels' chaplain and later added the Ducks to his ministry. Former Rams linebacker Kevin Greene credits Obremski with saving his soul. "Oh Chuckie ...," he said by phone, as a hurricane bore down on his Florida home. "There's not too many men that I'll tell I love them, but I tell Chuck. Says longtime Angel Salmon: "As a Christian ballplayer there's only a few people I can really open myself up to. Chuck is on the short list." Obremski is so dedicated to his sports ministry that he schedules his cancer treatments and his church services around it. "He has chemo on Mondays and other procedures early in the week just so he can be in the pulpit on Sundays and at the stadium right afterward," his wife said. The athletes appreciate it. "I have a peace in knowing that some things that happen aren't in my control, and I'm OK with that now, because of Chuck," Angels left fielder Garret Anderson said. The team showed its appreciation on Easter Sunday 2003, by presenting the chaplain with a World Series ring. "I was overwhelmed, shocked and humbled, but appreciative," he said. "Chuck's true character has been revealed through this disease and suffering," Linda Obremski said. "There's no anger or depression. It has just put everything into perspective." Bald, frail and hollow-eyed - his clothes clearly too big for him now - Obremski is realistic about his fate but making the most of life, relying on his faith and sense of humor. "I have walked through the valley of the shadow of death," he said, grinning. "And now I know why you never see a U-Haul behind a hearse." To hear fist hand...about Chuck's experience on the "cancer coaster"...I recommend you get a copy of "Desperation to Dependence" CD set. See the contact info below. Kindred Community Church is at 8712 East Santa Ana Canyon Road, Anaheim Hills. Call (714) 282-9941. This is one of several "posts" concerning Chuck Obremski. Click here for others that have appeared in the past. Here's another one! Click here for more!